31 percent of US households have struggled to afford their energy bills, according to a Wednesday report by the Energy Information Administration, which notes that Hispanics and racial minorities were hit the hardest. Meanwhile, 11% of households surveyed keep their home at a unsafe or unhealthy temperature, whatever that means. "Of the 25 million households that reported forgoing food and medicine to pay energy bills, 7 million faced that decision nearly every month," reads the report. "Of the 17 million households who reported receiving a disconnection notice, 2 million reported that they received a notice nearly every month." The data, from the federal agency's most recent energy consumption survey in 2015, also showed that some seven million households (6% of the national total) reported broken heating equipment, while 6 million (5%) reported the loss of air conditioning. EIA found only minor differences across geographic regions of the country and between urban and rural respondents. These differences suggest that the structural features of a home and demographic characteristics are more likely to be associated with a household’s ability to afford energy and maintain equipment than geography and associated climates. 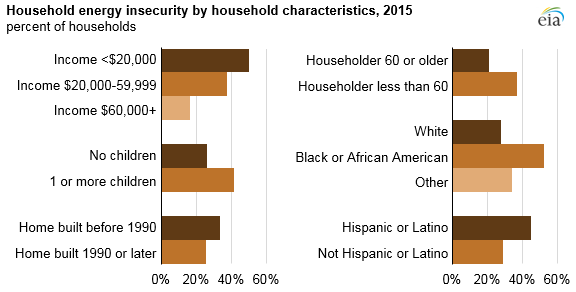 NPR adds that people of color were disproportionately affected, with about half of respondents who reported challenges paying their energy bills identified as black, while 40% identified as Latino. A 2016 study conducted by the American Council for Energy-Efficient Economy and Energy Efficiency for All found that black and latino households "paid more for utilities per square foot than the average household," partially because low income housing tends to be less energy efficient. Last fall and winter, the Trump administration called for an end to the Low Income Home Energy Assistance Program, according to NPR. "Please I beg you to bring back this assistance with electricity," wrote a north Texas woman after a state assistance program called Lite-Up Texas ran out of money, according to The Texas Tribune. "I am going to freeze during this cold season."